If you cruise around to the back of Pierce College in Woodland Hills, over by the stables down the back entrance and along a badly in need of re-paving road, you'll find the Old Trapper's Lodge tucked practically out of sight in this remote area of the school. Most of the students probably don't even know it exists and the administration fully admits that they don't pay for the location's upkeep. 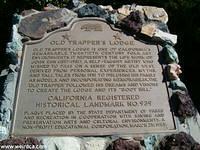 What is the Old Trapper's Lodge? Why it's several statues and folk art depicting aspects, myths, tall tales and stories about the old west built by the Old Trapper himself, John Ehn. John Ehn was born in 1897. Before moving to California, he was a trapper, but upon moving to the state, he opened up a motel in 1941 near the Burbank airport at Arvilla Avenue and San Fernando Road. The motel had western memorabilia in the office including old weapons and animal pelts. In order to attract more attention to his motel, called appropriately the Old Trapper's Lodge, Ehn decided to have a sculpture built on the site. If you believe the story, he originally hired Claude Bell, then of Knot's Berry Farm, to build the initial sculpture. Claude Bell would obviously go on to build the giant dinosaurs of Cabazon. Supposedly, after watching Bell sculpt for three days, Ehn figured he was now a proficient sculptor and in 1951 off he went, building the multitude of statues today found on Pierce College. 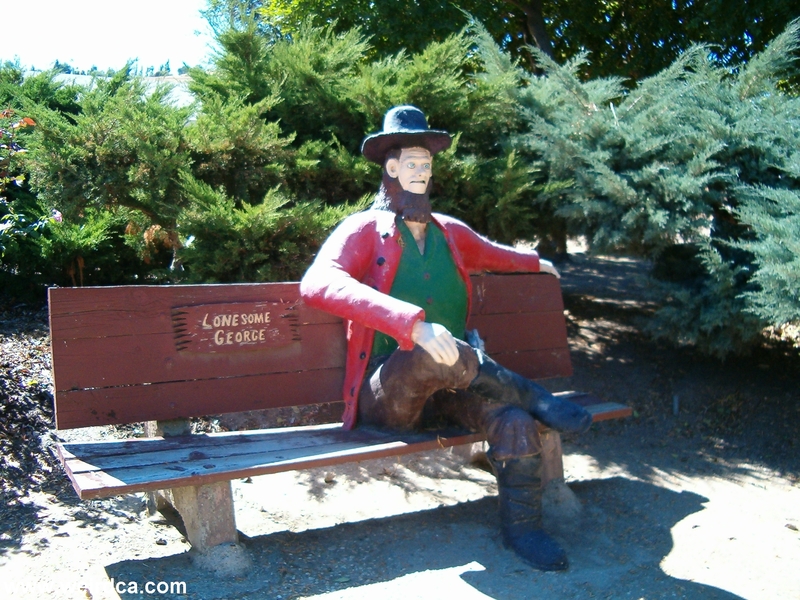 For the next thirty years until his death in 1981, using his self taught knowledge, John filled the front yard of his motel with folk art, by sculpting a variety of statues depicting myths, tall tales, and apparently personal experiences from the Old West. 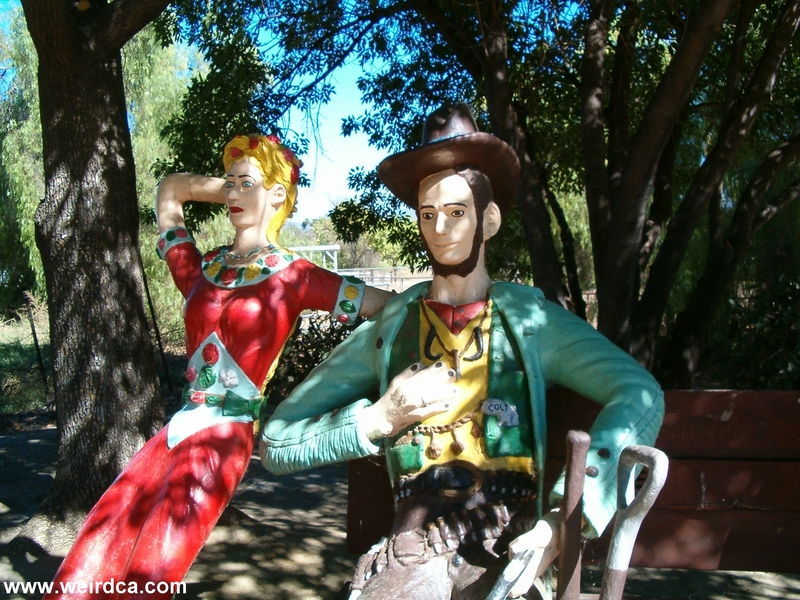 The statues feature cowboys, cowgirls, Indians, miners, saloon girls and other personages from the old west. John used the likeness of his family to create the statues. 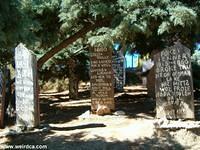 He also built his own version of a "Boot Hill", a mock cemetery of colorful and at times humorous tombstones. 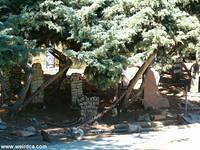 The entire site became California Historical Landmark Number 939 in 1985. Around that time, the land the motel was on had been sold to the nearby airport. The motel was sadly torn down, but luckily most of the statues and other folk art were saved and transferred to Pierce College in Woodland Hills. Now the area near the Animal Sciences Building is filled with strange faces peering out from the ground and bizarre scenes of the old west. 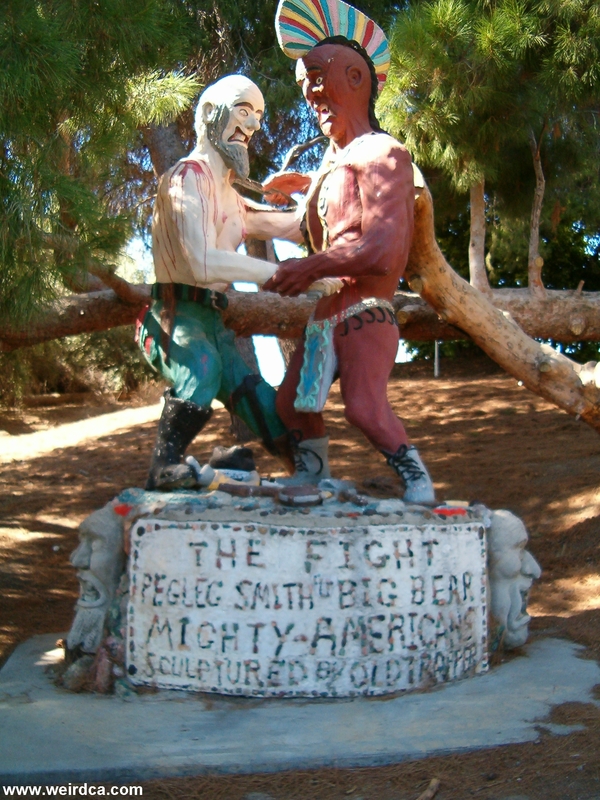 One sculpture shows Peg Leg Smith squaring off with Big Bear, a Native American. 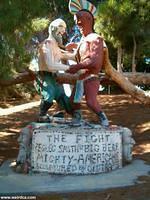 Peg Leg Smith was a mountain man, a prospector, and a spinner of tall tales, who lived from 1801 to 1866. Another sculpture entitled "Kidnapped" shows a Native American kidnapping a woman. Others show other fanciful characters such as Lonesome George. No one at Pierce College will say who allowed the historical folk art to be hosted at the community college. Nor will they admit to who performs maintenance on them. Every few years though, someone shows up and touches up the paint jobs on the colorful statues. The grounds and trails are also occasionally fixed up also by these mysterious caretakers. All the college seems to care about is that they don't pay the upkeep cost. While it seems the historical landmark receives little attention from any one else in the outside world, particularly from the students who seem for the most part unaware of its existence, someone else takes a keen interest in continually maintaining these wonderful works of the past. Who this is, we don't know. Regardless, the Old Trapper's Lodge is very much worthy of a visit. Take 101 North (or 101 West) to the Winnetka Avenue exit in Woodland Hills. Turn Right and go past the college to the next light, make a left and go to El Rancho Drive. To get to the sculptures enter the campus from El Rancho Drive. The Old Trapper's Lodge will be on your left, just past the horses. Old Trapper's Lodge is one of California's remarkable twentieth century folk art environments. It represents the life work of John Ehn (1897 - 1981). A self-taught artist who wished to pass on a sense of the old west, derived from personal experiences, myths, and tall tales. From 1951 to 1981, using his family as models, and incorporating memorabilia, the "Old Trapper" followed his dreams and visions to create the lodge and its "Boot Hill". California Registered Historical Landmark No. 939. I live at the Old Trappers Lodge in 1973 - 1974 with my dad and brother, I seen a man hanged on the cloth line outside my window, it's told he turned his people in to immigration for money.. other than that I enjoyed living there and watching the planes from Burbank Airport land next to my unit. I was born in Roscoe Ca. It's now called Sun Valley. I remember the old Trapper's Lodge as a four or five year old. It was so mysterious and scary. Then as a teen in the late 1950s I went to work at the self service gas station on SF Road and Buena Vista Some of my work mates lived at Old Trapper's. It was still mysterious. Next time I'm in SoCal I will stop by Pierce. And thanks for the trip down memory lane. As a young child we lived next door to old Trapper on arvila. 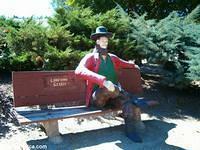 My sister and i would sit in our wagon at the fence and watch him paint these stautes, falling asleep right there. I also went to school with his grandchildren The Crosby girls. My father was John Phillips, O. T.'s daughter Lorraine's son. I know I'm not the only family that would love to see any of the films shot here. My great grandfather never threw anything away unless he had to. He took the adage from hunting, use every part, and applied it to everything. The grandchildren all got necklaces made from antler, snake vertebrae, teeth, claws and bright beads. When I as a little girl in about 1955 or maybe 56 cant really remember the year we lived in Old Trappers Lodge we would move back and forth froth from Ok.to cal.so lived there twice and I think the managers name was Harry have pictures can't get to them now. I grew up in Sun Valley (lived there 1955-1971)about 6 blocks from Old Trapper's, and remember my dad driving us through the Lodge property once in awhile, just to see the statues and all the other masses of weird stuff on the property. It always looked fascinating to me, but also pretty run-down and depressing in a way - a place for the down-and-out, people who had hit rock-bottom on the economic scale and had run out of better options. We understood that people actually lived there, and that was amazing to me - we all felt kind of sorry for them, but I always envied them (a bit!) too. Even though my dad had a good job, he was perpetually worried about money (he had 10 kids). When he was feeling particularly impecunious, he used to muse aloud to us that if money got any tighter, or if he lost his job, "We might all have to go live in Old Trapper's Lodge." To him, this was the ultimate nightmare, and threat, but I was always secretly intrigued at the prospect: What an adventure that would be! For a 10-year-old kid, it sounded fascinating. I lived at Old Trappers in 1969 with my family. At 11 years old, “Old Trappers” seemed more like a fantasy world than a hotel. It was quite a large complex with duplexes, single units and many long low multi-unit buildings. 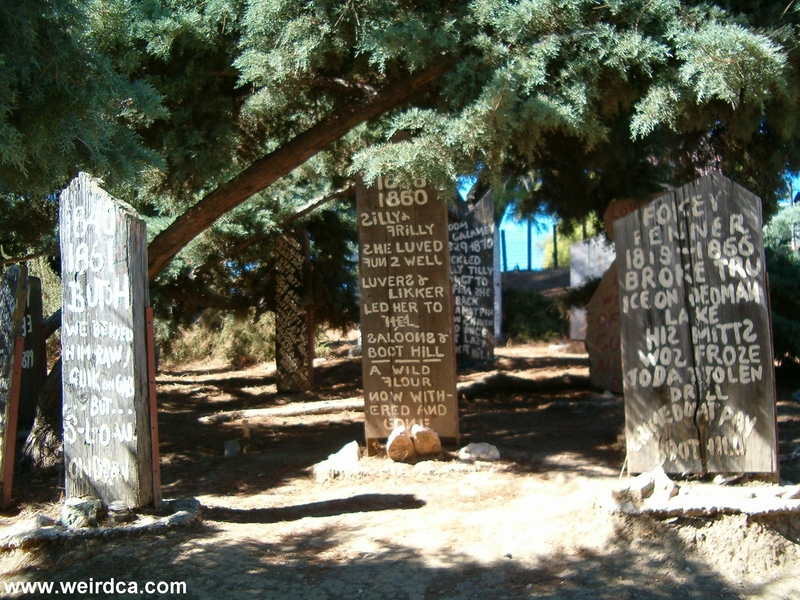 I spent almost every day wondering through the “boot hill”, reading the epitaphs and reliving the old west through the eyes of John Ehn. Seeing these photos brings a flood of memories back to me. And now I can show my children some of the art that I grew up living around in that weird and wonderful place that I’ve told them about so many times. Faith, I often wonder about your mom, as I pass her house daily. I hope that you and the boys are well. I still work in the same place. A few of us are still there from the old days. My grandfather worked for Rosie Farish as a handyman for many years. I used to live there for a short time when I was a little girl. I remember thinking it was a magical place. Growing up in Burbank was great and bizzare at the same time. 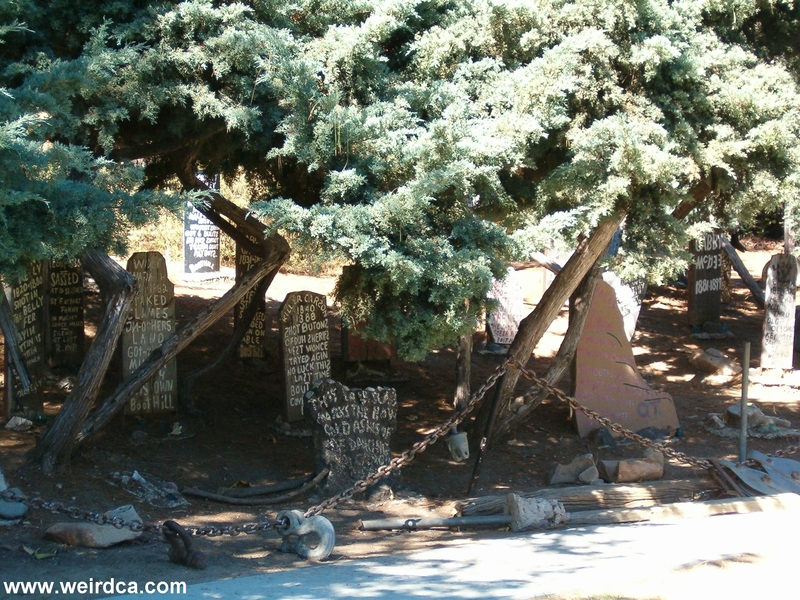 Movie studios,cemeteries and the Trappers Lodge! The Burton brothers and myself usually rode our Shwinns past the lodge as fast as we could! I remember going to Old Trappers Lodge just to walk around when I was a little kid in the 60's it was a scary yet exciting place then. A long ago piece of Burbank history glad to hear it is still around! I to am connected to this whimiscal place. As a child I used to roam through through this mysterious place. My grandmother used to work for the lodge and live next door. This place was amazing and I had really good memories of this time period. Thanks for comments about this place, it seems that it has brought joy to many as myself! Wow, this brings back some strange memories. We moved from PA to Old Trappers Lodge when we were very young - my sisters and I only remember being scared of the strange (life size statues). It's interesting to take a trip down memory lane and look at it from a grown up perspective. I'm glad to know that the statues were preserved. The sculptures were "saved" by Seymour Rosen and his organization SPACES (Saving and Preserving Arts and Cultural Environments), same group that helped preserve the Watts Towers. I was honored to call Seymour a friend and help him with his work, which also included helping preserve Grandma Prisbreys Bottle Village and the Amargosa Opera House. Old Trappers Lodge kind of set me up artistically and contemporary folk art environments like that have been a lifelong passion. Funny, I also made a Super 8 movie there in the late 70s...still have it. My husband went to run the hills at Pierce and discovered this hidden treasure. We had to come home and look up the Old Trapper's Lodge. It's amazing to find little historical gifts like this. It looks like the sculptures are in need of a touch up though, it would be a shame to let this wonderful place atrophy. I shot a 16mm independent film at The Old Trapper's Lodge back in 1979. Rose Marie Farish, John Ehn's granddaughter(?) was the manager and the nicest person you'd ever meet. OT was a real character! My only regret is we shot the film in black and white. Too bad as it was such a colorful place. I am proud to say that the Old Trapper, John Ehn, is my great grandfather!! I can't believe his stuff has gotten so much publicity!! I love being an Ehn. Does anyone know where any of Johns books are on trapping? I don't believe in coincidences... ok so my brother sent me this link because we both used to live at the old trappers lodge back around 1980. and i thought it was real interesting, then i saw the comment by Steve of North Hollywood about his purchase of a 1954 Jeep Willys that used to be owned by the old Trapper. Well just coincidentally about 15 years ago my family aquired an old Jeep Willys wagon that if i recall was probably a '54, i loved that wagon, i always thought it would be my first car but then someone stole it... Steve... then i remembered after we moved out of the old trappers (i was about 5) we moved into this other place and had to have room mates, and one of their names was... you guessed it... STEVE! i remember he used to put me on top of the refrigerator when he didn't want me to go anywhere. like i said i don't believe in coincidences, i think if me and steve and the willys and the old trappers were all to meet again at the same place it would rip a hole in the space-time continuume! it would be the end of the world! AHHH!! I'm Dallas Caley's mom. We lived at the "Old Trapper's" in 1978. I was told by the "Old Trapper's" daughter (who was one of the manager's of the motel, that he was from Mich.. We lived in one of the little adobe apts. which rented at that time for about $185. I have old pictures of taken of family sitting between the statues. I googled Trappers Lodge, and found this, because I just purchased a 1954 Willy's Wagon, and the first owner was apparently the owner of The Old Trappers Lodge in Burbank. Kinda cool this truck has a little history now! I lived at Old Trappers lodge (with my 4 daughters) in the late 70's. How great to see these old statues again. I lived in the lodge apartments 1959-1960. I watched John Ehn make a large Totem in his shop building that was between the Lodge Office and Air Port. It was set up in front of the Lodge. I know that some of the statues went to Pierce College. What happened to all the other stuff? Man! I totally remember Old Trappers Lodge when it was back in Burbank. My Dad use to work right by the Airport and every once in a while he would take us to the Lodge. I get this weird chill thinking about it because it was usaully after his work time and it was near sunset. There use to be this old decaying 50's style motor home trailer that displayed very old decaying stufted animals with some kind of story to it. Inside the office itself was filled with old black and white pictures of Ehn himself with animal trophies. There was this huge mounted bear standing near the entrance. We spoke to his grand daughter who was running the Lodge at the time. There was also this glass case that had a collection of what seemed to be vintage old six shooter pistols right outside the entrance way. I really miss that place. It really took me a place of sincere mystical curiosity. This was back in the 70's, around maybe 1974, 75, time period. Thanks for taking me back there. Do you know any other word on what happened to the old place before the sculpters were taken to Pierce? Thanks for your memories about the Old Trapper's Lodge! I really appreciate it. Sadly the land the Lodge was on was acquired by the Burbank Airport in the mid eighties. Regretably it was all torn down. To the best of my knowledge only the statues were saved. As to what happened to the rest of the memorabilia, including all the stuffed animals, furs, and pistols, I sadly have no clue. I'm assuming that much of it was probably junked. Hopefully some of it was preserved, but if so, I don't know its current where abouts. If anyone has or knows where any of the rest of the Lodge's memorabilia went to, please let us know! Thanks!